Borneo is the world’s third-largest island. Sabak and Sarawak in the north are part of Malaysia, Kalimantan in the center and south is part of Indonesia, and the Sultanate of Brunei occupies a part of the island along the northern coast. The island was known for centuries to the Indians, Chinese, Arabs, and Japanese, but came under increasing Dutch and British influence from the 17th century onward. In 1878, the Sultan of Sulu leased the northern part of the island to the British North Borneo Company. This map, drawn up by W.M. Crocker, a representative of the company who had lived in Sarawak for 16 years, was presented to a meeting of the Royal Geographical Society in London in February 1881. 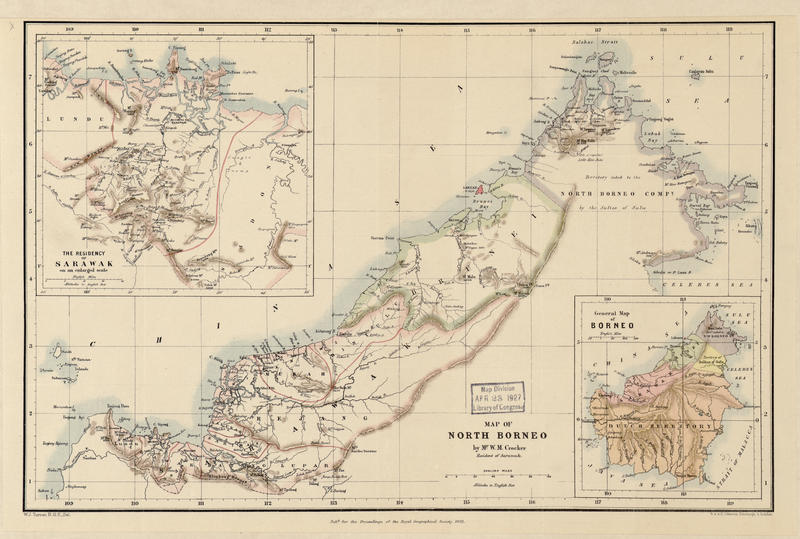 The blank space on the main map of North Borneo indicates how much of the interior of the island was as yet unmapped. The inset map at the upper left shows the Residency of Sarawak, a nominally sovereign territory controlled by the family of the British empire builder Sir James Brooke. The inset General Map of Borneo on the lower right shows the division of the island at the time into territories belonging to the Dutch, the Sultan of Sulu, the Sultan of Brunei, and the North Borneo Company.